I posted back on Feb. 10th about the start of a jig saw puzzle I bought for $3.99 at Job Lots. It brought out the secret puzzle lovers of my little audience and a few new folks commented. It would appear there are lots of us out here who love the challenge (frustration?) of those quirky little pieces…you just can’t walk by without thinking you see something that fits. I had a good third or so of it done when the cat decided she might give it a go. She jumped up on the table and knocked the entire bottom section to the floor. After threatening to toss her out into the snow storm, I carefully reconstructed days worth of work. I’ve gotten this far and am tempted to quit as now it all comes down to colors and shapes…but of course I will finish it. This entry was posted in memoir. Tagged cats, games, hobbies, Jig saw puzzles, memoir, New Hampshire Winters, Puzzles. I’m reluctant to admit this but I didn’t finish mine. 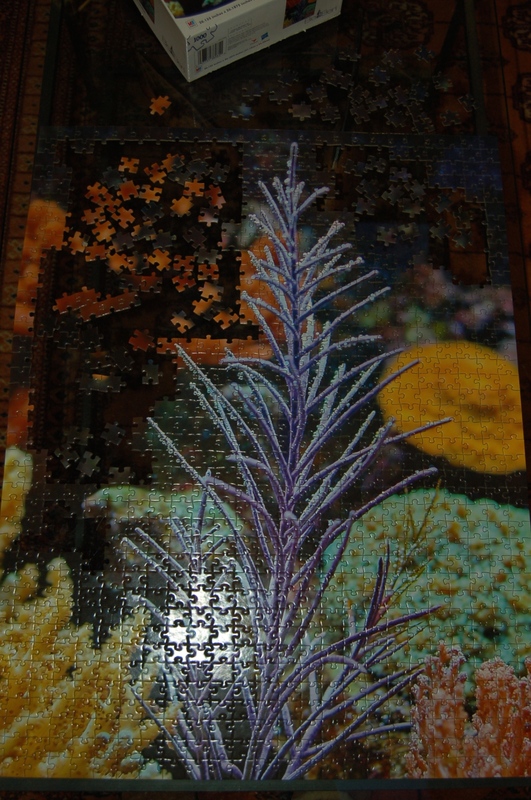 In my eagerness to revamp my living room with elements of spring, I hastily boxed up my puzzle and put it away. That’s OK Julie. 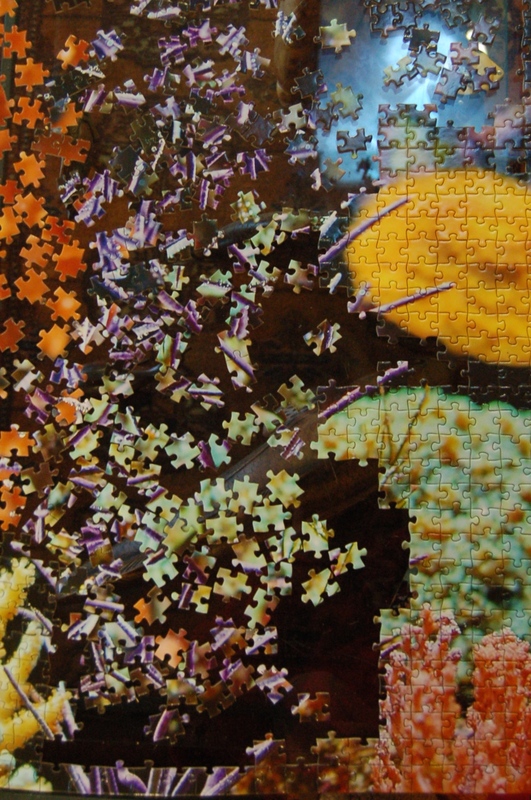 Puzzles have no expiration date, it will be there when you want to get back to it! It’s coming along nicely. Glad the cat hasn’t helped you again! I may have to give up now that it is all just slight shades of color and shapes! Come home and help me out!! The Currier Museum had a jigsaw puzzle out in its Photo-Realism exhibit. It stopped me like a fleece stops a house cat. The gallery was empty and I wanted to sit down and work on it but we only had 20 minutes left before the museum closed. I thought it was a great idea. Cheapest entertainment with no commercial breaks! I finally finished and happily boxed it back up. Love puzzles but that was a tough one and a huge time sink! Yes, cats are not good around all those little pieces!